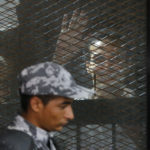 Al-Jazeera's Egyptian journalist Abdullah Elshamy, center, appears in a defendants' cage along with several other defendants in a courthouse during a hearing Cairo, May 15, 2014 (AP Photo/Hamada Elrasam). For a time, journalist Abdullah Elshamy was the face of resistance in Egypt. 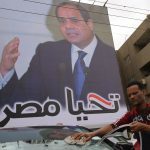 After army chief Gen. Abdel Fatah el-Sissi led a July 2013 coup toppling the democratically-elected president Mohammed Morsi, major street protests against the military broke out in Cairo. Elshamy, who is originally from Beheira in the Nile delta, was a correspondent working for al-Jazeera at the time. 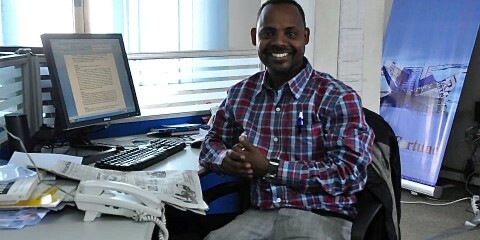 He had only recently returned to Egypt from assignment in Nigeria to cover the unrest. Elshamy managed to avoid the bullets, but he and hundreds of others were arrested as crowds fled the area around the mosque. Elshamy was taken to prison and held without trial for months. Losing hope, in January 2014 Elshamy decided to begin a hunger strike. Over the next several months, he would lose about 88 pounds (40 kg). His case garnered international headlines, especially after he managed to record a dire video from inside jail on the 106th day of his hunger strike and have it smuggled out. “If anything happens to my safety, I hold the Egyptian regime with the responsibility of that,” he said on the video. Efforts by prison authorities to force-feed him and punish him by placing him in solitary confinement failed. 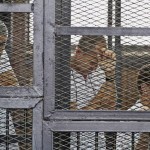 In June 2014, Egyptian prosecutors decided to release him because of his declining health. Elshamy was met outside the prison by a throng of family members, supporters and the press. 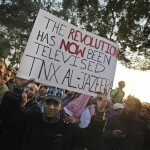 Elshamy soon moved to Qatar and resumed work for the Qatari-owned al-Jazeera. 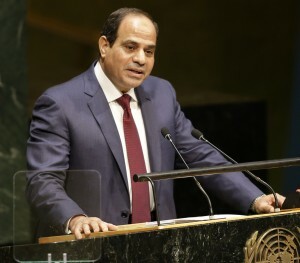 Egyptian prosecutors eventually brought charges against him in absentia, as well as against hundreds of others imprisoned after the 2013 demonstrations. A verdict in the trial is expected in the coming months. Meanwhile, press freedom in Egypt has not improved under el-Sissi, who has been president since 2014. More than 35 journalists and bloggers are in prison in the country, according to Reporters Without Borders. Global Journalist: What happened in the lead-up to your arrest? 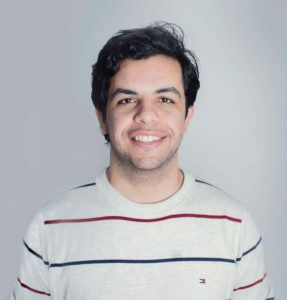 Elshamy: Back in 2013 I was working as a reporter for al-Jazeera when the events started taking place in Egypt, the tensions between the president [Morsi] and the army. Just a few days before the military coup took place in Egypt on the 3rd of July 2013, I was asked by management to go from Nigeria where I was stationed, to Cairo, to be able to cover events. I never had in my wildest dreams [thought] things would end up like that. I mean, I covered more serious and dangerous things. Before this I was in Libya during the [civil] war back in 2011 and I was also in Mali when the  French intervention happened in the north of the country. So it was for me, probably just another round of demonstrations and things would cool down eventually and the politics would work out. So I went there and I covered the events from both sides. Things went on for several weeks [after the coup] until the army and the police moved in on the demonstrations on the eastern side of Cairo. On the 14th of August 2013, the army and the police were detaining everyone coming out of [the Rabaa al-Adawiya] area. I was among those arrested. And from that point, from the 14th of August 2013 until the 18th of June 2014, I was put in detention without trial. GJ: How did being a journalist affect your time in prison? Elshamy: At the beginning, they didn’t know I was a journalist because I tried not to mention that. I feared there might be a severe response if they found out. When the authorities [learned] I was a journalist it didn’t actually change much. It made them put more restrictions on my time in prison. They monitored the letters I got and the visits from my family. But at they put me among the demonstrators that were arrested on that day. They insisted I was a criminal, not a journalist. 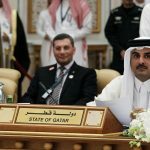 There were I would say, focused attacks on me because when they found out I was a journalist at al-Jazeera, relations between Egypt and Qatar were not the best. I was harassed by the guards because they thought of me as a spy. Nothing made sense at that point…I was not the only journalist in prison. One of my colleagues [Mahmoud Abu Zeid, better known as Shawkan], is a freelance photojournalist who was detained on the same day with me, and up until this day he is in prison. GJ: Tell us about the hunger strike and how it led to your release. Elshamy: The last week of January 2014 I decided I was going on a hunger strike, because I was in prison at that point for five months and nothing was happening in terms of my release. My lawyers gave several documents to prove I was [at the protest] doing my work. They’d requested I be released on bail. When I decided that I was going on hunger strike, the prison authorities at the beginning…they made fun of the whole thing. But then when it was March and I was losing weight and my health was not the best, the Ministry of Interior thought that they would start to intimidate me into giving up on the whole thing. Eventually when they found out that I wasn’t giving up on the hunger strike, I was sent to a maximum security prison for the next five weeks before my release. That was the hardest part of the whole prison experience because I only saw my family once in those five weeks. I was kept in a solitary confinement cell. I wasn’t allowed to see anyone. Even when I was given time to walk out of my cell, it was at the end of the day while all the other inmates in the ward were not present. It was psychological pressure. They thought maybe this would break me down. Eventually, because of the pressure [from] outside media…and even the local media, I was released. But then I had to leave the country because, of course, you can see how Egypt is now in 2018. It’s even more dangerous. GJ: How is life for you now? Elshamy: Although I was released four years ago, I’m still being tried in absentia. I cannot go back to Egypt. I risk being arrested and it’s kind of a dead end for me at this point. As the trial approaches its end, I face probably a life sentence or maybe even worse. The idea of not being able to go back to your own country…is just heartbreaking.